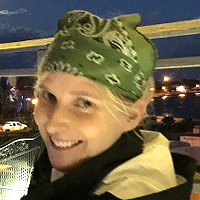 Chersti Hansen joined the team at Alpha Omega Academy in November of 2014. As an academic counselor, she plays an important role in keeping students on track in their coursework and helping them build the skills they need to tackle any challenges life throws their way. She also hosts a variety of online classes that address topics including stress and time management, study skills, and college preparation. A native of Southern Minnesota, Hansen earned her bachelor’s and master’s degrees from Minnesota State University, Mankato. Prior to her time at Alpha Omega Academy, she worked within the fields of teaching, academic advising, and mental health counseling. Hansen describes her younger years as action-packed. “Growing up adjacent to a park with three baseball diamonds, a lake, a pool, volleyball and tennis courts, as well as a hockey rink, kept me busy full-time as a child,” she said. Today Hansen’s hobbies include painting, traveling, being outdoors, and spending time with family, friends, and her fluffy K9 Iggy the Husky. Of all the places she’s visited, Hungary, Russia, and Western Europe make the list of destinations she’d like to visit again someday. “My journeys abroad have given me insight into and appreciation for different cultures, without which, I wouldn’t have a deeper understanding of my own,” Hansen said. Although she says she cannot sing and imagines her work day would look quite different, Hansen would be an opera singer if she could choose another career. Amazing Grace tops her list of all-time favorite songs. If she could meet anyone in the world, Hansen would choose to go back in time to meet her great grandfather. Originally from France, his portrait hangs today at the Mayo Clinic for his achievements as a physician. “From stories I’ve heard, Dr. Leon was one cool customer,” Hansen said. “Let the wise hear and increase in learning, and the one who understands obtain guidance” (Proverbs 1:5). "My three kids have attended AOA for the past four years. It sure has improved one of my son's reading. They learn much more than the traditional school setting, and AOA has great curriculum. Not only is the education wonderful, the members of the academy are great and helpful. "—Lourdes N.